Normally during Summer time gamers usually find themselves with very few new game releases, but this is going to change, August 2013 is just around us, so here is look at Seven games not to miss in August 2013. Explore an alien world like no other in the third edition of Nintendo's strategic adventure series. In Pikmin 3, players take command of three explorers and a legion of adorable Pikmin in a fight for survival. By employing the unique abilities of these tiny Pikmin creatures, players will solve puzzles, battle dangerous predators, and recover food needed to save the explorers’ depleted home planet. Dragon's Crown thrusts you into a fantastical medieval world packed with labyrinthine dungeons to explore, vile monstrosities to smite, and nearly endless online adventure. Your mission is to dive into the dank underworld, uncovering treasure and strengthening your mettle as you unlock the secret behind the ancient dragon threatening the world. Simple, easy-to-learn controls allow anyone to dive into the fray and enjoy the breathtaking sword-and-sorcery action. In addition to long-lasting gameplay, the game also features a vast array of character customization features - with six wildly different classes to play as, raiding the catacombs for epic loot remains fresh and engaging. Although intrepid adventurers can certainly enjoy Dragon's Crown on their own, the real excitement begins when four players team up online for a four-player cooperative mission. And don't expect the portable Dragon's Crown to be scaled back in any way: The game will offer the same fluid hand-drawn animation, blazing special effects, and haunting soundtrack on both PS3TM and the new PS Vita, with some special interoperability features between the two versions to be revealed at a later date. Tales of Xillia follows Jude Mathis, a clever medical student attending school in the capital city, and Milla Maxwell, a mysterious woman accompanied by four unseen beings. Players will be able to choose either Milla or Jude at the outset of their adventure through the world of Rieze Maxia, where humans and spirits live together in harmony. The kingdom of Rashugal has been experimenting with a powerful device that has been draining the mana from the world. Realizing the harm it is inflicting on the world, Milla and Jude set off on a journey to destroy it and restore the mana back to the world. Over the course of the game their lives will intersect with a vast ensemble of characters that will teach them the strength of unwavering conviction. Players will engage enemies with the critically acclaimed Linear Motion Battle System that the Tales of series is famous for. The system allows for real-time movement and attacks, giving the player a more tactile role in the midst of fights. The battle system in Tales of Xillia has been upgraded to Double Raid Linear Motion Battle System to let two characters combine their attacks to utilize devastating dual-character attack, letting fans strategize the best party setup for their style of play. The battle of humans against an invading alien force erupts in The Bureau: XCOM Declassified, a new story and unique gameplay experience set inside one of gaming's most storied and beloved franchises. Set in 1962 at the height of the Cold War, The Bureau tells the origin story of the clandestine XCOM organization's first encounter with a mysterious and devastating enemy. Originally established as America's covert defense against the Soviet Union, The Bureau must adapt and overcome a threat unlike anything the world has faced before. As special agent William Carter, players will call the shots and pull the trigger, leading their squad of agents in the high-stakes secret war for humanity’s survival. Paramount to repelling the outside threat is The Bureau’s ability to cover-up the enemy’s existence in order to prevent worldwide panic. In the spirit of the XCOM franchise, The Bureau's calculated combat design requires players to think and act tactically. The game's third-person perspective gives the player a sense of spatial awareness and grants them the freedom to transition in and out Carter's unique Battle Focus ability seamlessly -- heightening the tactical shooter action. The Bureau also fully embraces the concept of permanent consequence. As our last line of defense, every command can mean the difference between life and death for Carter, his squad and mankind. The United States has a military presence in two thirds of countries around the world. A group of 12 have had enough and initiate a terror ultimatum called the Blacklist -- a deadly countdown of escalating terrorist attacks on U.S. interests. 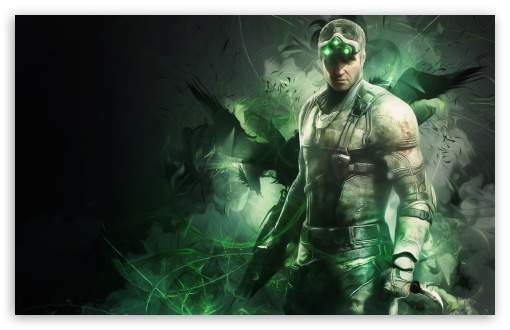 Sam Fisher is the leader of the newly formed 4th Echelon unit: a clandestine unit that answers solely to the President of the United States. Sam and his team must hunt down these terrorists by any means necessary, and stop the Blacklist countdown before it reaches zero. Unleash the power of the most lethal agent to ever exist. You've been given the ultimate freedom to protect innocents against the Blacklist terror attacks known as -- the freedom to use limitless force, to break every law, and to become the globe's deadliest operative. If you succeed, the President of the United States will deny you exist. If you fail, millions will die. Killer is Dead is a project by iconoclast game designer Suda51, though not a sequel (as one might guess) to Killer7 -- instead, this game follows an imprisoned man who much kill the one who is trying to kill him. The player takes control of an executioner named Mondo Zappa who wields a Japanese sword in his right hand and brandishes interchangeable weapons in his left artificial arm. The MMO role-playing game Final Fantasy XIV: A Realm Reborn invites you to explore the world of Eorzea with friends from across the world. Forge friendships, mount up on a chocobo, board an airship with your friends and create your own unique stories within the Final Fantasy Universe. Undertake epic quests and battle with familiar Final Fantasy monsters alone or enlist the help of your friends. Each player will have their own unique abilities and equipment that they have acquired during their adventures. Work together to help forge the fate of Eorzea! The life of an adventurer is the pursuit of fortune and the pursuit of fame. It is the devotion of oneself to seeking out danger and glory wherever they might lie. It is an endless quest taken up only by the most intrepid and dauntless of souls. The people of Eorzea come with their myriad pleas and requests to their local Adventurers' Guild, and here it is that adventurers heed the call, whether it be the slaying of some foul beast plaguing the countryside, or the crafting of fine wares demanding a master's touch.